So, there I was minding my own business getting all too little work done and browsing Jalopnik when I got an email from a friend. His Uncle was getting too old for the triple digit speeds of navigating a Trophy Truck and so he’d like to have me out for a ride while they were Testing to see how I did. We grabbed a hotel room and got up early for some seat time. Professional driver and generally good guy Justin Lofton came out to consult on the truck’s setup. After putting on the familiar gear from racing a 1600 desert car (fire suit, helmet with air pumper) I sorted through the new to me gear. A hans devise head restraint and wired in ear buds were a nice change from what I’m used to. After all, if you’re going to go about twice the speed I’m used to racing, you’d better take safety up a bit. I got to ride with Justin first and despite being in an unfamiliar truck, he drives it like it’s so familiar that it must be his. Within a couple seconds the 850HP monster was breathing at top RPM and it was deafening... Wonderful deafening fun! Corrections to steering input, shifting, line adjustments, hitting bumps that are a 1/4 mile out. You see it and then it just happened. Not right now, now is too late. Everything, was, so, fast. I love it. Within a few miles I was still overwhelmed, but a calm came over me. This is the speed life should happen at, at least for an hour or two each day. It somehow brought an immense calm, underscored by a bit of terror by not being in control. I’m a control freak. Hence, why all my sports involve piloting something. You have to decide quickly whether you trust the person driving. I trusted Justin, but I felt that he was young enough to not have had as many crashes as me and no family yet so I was worried he took more chances than I would. Not many, but just a bit more. Oh well, this was an experience so hold on and enjoy! You can’t open the door and roll to safety at 100MPH plus. The fluidity of his driving was impressive. Small inputs and small corrections, make for few and far between small mistakes. No see-sawing the wheel. There were good lessons to remember from watching him. Then Rob and I rode together. Rob has seat time from racing in the desert his entire life (class 12, Protruck, dirt bikes), but less Trophy Truck seat time than Justin. It took us a lap of our impromptu course to get bearings. He did just what I would in a new truck. (He’s raced this truck a few times, but it’s been 6 months since he’d been in it so to me, you consider that a new truck. These trucks are almost completely rebuilt after each race. 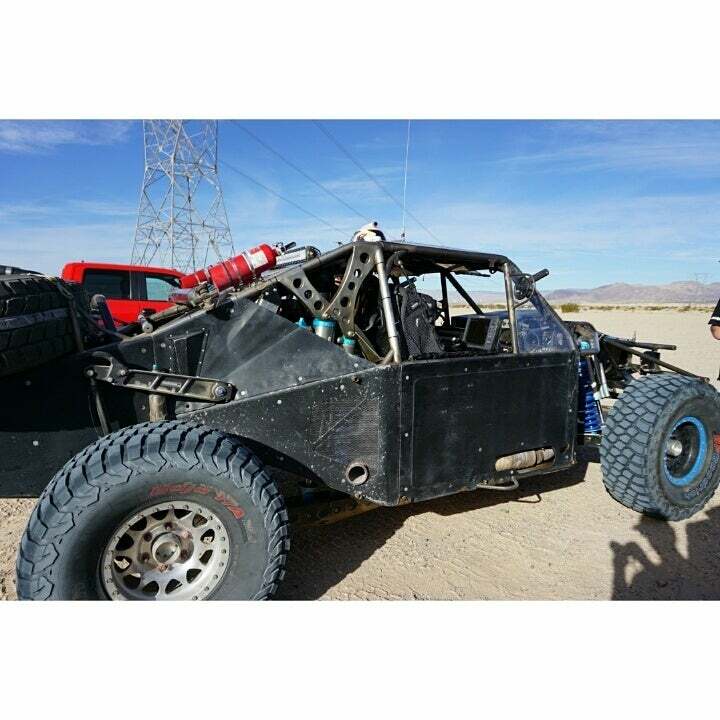 This one had an entire new top half put on it after a recent crash) We tested the brakes with some hard stops and messed around with the transmission to test the new sequential setup (it was a new fancy Fortin 5 speed transmission). Then it was time to put in a quick one for fun. You don’t accelerate so much as you light a bomb and it explodes. The truck throws you back into the seat despite trying to get traction from two GIANT 39” BFG Baja Project tires spinning in the sand and silt. Before you know it you aren’t bouncing in, but on top of the bumps. 70MPH passes, 80 then 90 before you blink again. Now you hover around the 90’s to about 110 through the rough terrain. You slow to 50 or so for tight turns and hit 120 if there is even a slight straight away. In the turns you lean so far that you feel like you’re going to roll, but you just start to accept that this is where the truck is happy and go with it. Most of the big bumps are soft and smooth. 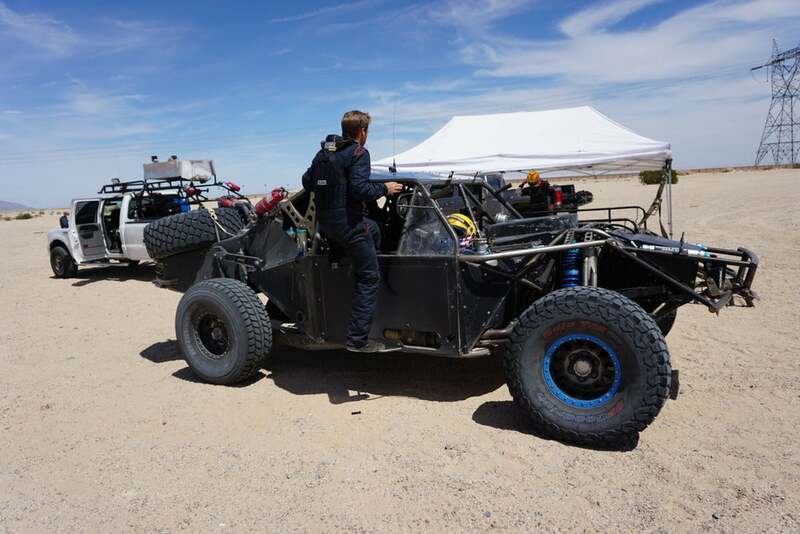 Much smoother than the slower racecars I’ve experienced in desert racing. Occasionally at high speed you hit a bit G-out or a deep trench throws the truck sideways into the air. These are the moments where the hits are harder than other classes. The speed is so great you feel your spine compress, but the truck always recovers. It has too much mass moving forward very quickly to spend much time sideways, unless it all goes very wrong. At almost the end of the day we backtrack to hunt for a lost spare tire. After finding it we proceed to the trailer and hear the failure we’ve been somewhat hoping to induce. A muffled metallic whirring noise sounds like some sort of gears are not happy. Being ground down or something. No big clunk, no big metal noise, just a whir... No more forward progress and the truck is done. Ready for a big rebuild before the next race. The splines on the drive shaft appear to have been spun. We’ll know more later, but it’s time for every single heim jont, the transmission, shocks and engine to all come apart anyway. Time to get ready for the next race. I just hope I’ll get to be a part of it. That’s it, the cherry is popped, and the sick, money wasting disease known as desert racing has been given a fresh hit directly into my veins and I fear for what it might mean for my future savings, life expectancy and ability to hold down a normal job. Oh well, I just want one more ride and then I’ll quite ditching work. Just one more and then I’ll refocus on advancing my practical office based career. Come on, and then I’ll get back to saving and putting into my 401k. I promise! Click HD and turn the volume up! !